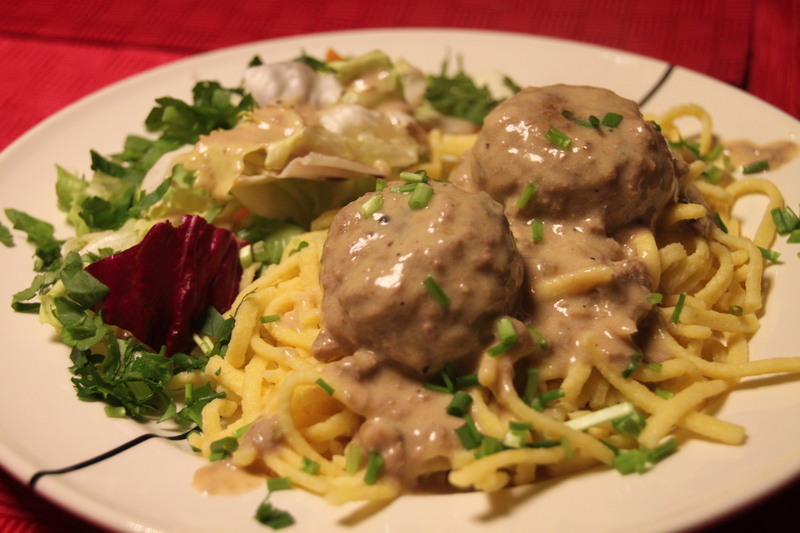 I found this german recipe on an Irish blog from people who had just visited Berlin. They had found the recipe on the website of the New York Times. I liked it quite a lot, and decided to make it last weekend. I bought the spätzle in the supermarket, though I made it already myself before. But I was a bit lazy, and concentrated on the meatballs. the dutch version of the recipe can be found here. Put veal in mixing bowl. Add pepper to taste. Heat 1 teaspoon of butter in saucepan and add onion and garlic. Add bread crumbs, parsley, chives and nutmeg. Shape mixture into 28 balls of equal size. Heat remaining butter in saucepan and add flour, stirring with wire whisk. When blended and smooth, add broth and wine, stirring rapidly with whisk. Stir gently from time to time so they cook evenly, about 25 minutes. Beat sour cream with the egg yolk and lemon juice. Beat in a little of hot sauce. If mixture boils, sauce may curdle. Serve hot with mashed potatoes or rice.